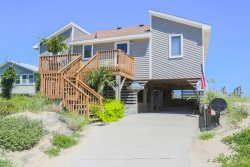 Well-appointed with a private pool, hot tub, and easy access to the pristine beaches of Corolla, C-JEM is a perfect vacation home for your Outer Banks retreat. This marvelous home away from home has five bedrooms, three baths, and plenty of square footage inside to relax. Load up the beach buggy and stroll over to the shore in the morning, as C-JEM is situated just a 10-minute walk to the nearest beach access in Section K in the highly popular Ocean Sands community, or spend a day exploring all of Corolla’s historic attractions, shops, and restaurants. The world is your oyster at this jewel of a vacation home. Though the beach is easy to reach, C-JEM guests will find plenty of reasons to relax at home, thanks to the private pool with nearby hot tub. Step through the pool entry to keep the fun going in the recreation room with a pool table, or enjoy an afternoon nap in the ground level with a queen bed. There’s also a convenient full bath on this level for easy breaks in between the pool and beach trips. Step up to the second level to enjoy a well-deserved rest in one of three delicately appointed bedrooms. There’s a bedroom with queen bed, a bedroom with pyramid bunk and twin bed, and a bedroom with two sets of bunk beds that’s perfect for the kids. A convenient laundry closet and full bath are nearby, and the hot tub on the shaded deck is just steps away for effortless relaxation. The top level is a nicely spacious haven for vacationers, thanks to an airy great room that’s packed with everything guests need to feel right at home. A screened porch is found just steps away, as is a sunny deck, and there’s also a king bedroom on this level with an adjoining full bath. With breezy area-wide views and cozy furnishings, this level is designed for reconnecting with the family. For family getaways where the ocean waves and sparkling pool waters steal the scene, C-JEM is hard to beat. Get your toes wet in the refreshing Corolla beach scene, and discover this gem that shines a light on how fun-filled the Outer Banks can be.